It’s that time of year again, the warm summer nights are over and it’s time to start getting your home ready for winter. Winter is the most brutal part of the year on a homes interior and exterior. Freezing temperatures add both punishment to the materials your home is made of and to the people fixing the home. Whether your a do-it-yourselfer or know you need a home contractor to get the job done- here is some information that will help in getting you home ready for winter in Pennsylvania. Southeastern PA is right on the borders of Climate Zones 4 and 5 as we have some cool summer years, but mostly hot ones. Being relatively close to the ocean makes humidity a hassle for most of the warm months. In the winter the humidity drops and homes tend to get too dry inside. With the constant freeze and thaw cycles between night and day and the huge seasonal change in humidity throughout the home; Pennsylvania seems like one brutal climate zone for homes. What can the average home owner do to help maintain there home in this region? Take advantage of Cool Fall Weather! This is the perfect time of year to get outside and take care of home maintenance projects. Make energy improvements that will save you money throughout the winter ahead. Close up any water penetration areas in the home envelope and in any outdoor areas before they freeze. Get ahead of heater season by getting your utility lines checked and systems serviced. Get the lawn prepped for next year. The fall is the easiest and best time to get the lawn looking great and ready for a successful growing season next year. If your not a do-it-yourselfer; give me a Call at 610-329-2880. As the owner of a construction and remodeling company for over 40 years I know how to maintain a home. Let me do an audit of your home with a free estimate for repairs. The first thing I look for when the fall season comes is failed caulking, roofing, siding, and fascia. If summer storms have put a toll on your home, these areas will be the biggest threat of penetration by water, insects, and even animals. Failed windows lead to a large amount of energy loss throughout the winter. You can find failed windows by looking for fogging or haziness between the panes of glass. There are multiple options for fixing windows; from repairing single panes to replacement and restoration. Doors can be a major source of energy robbing drafts. Proper alignment and weatherstripping must be used in order to stop leaky doors from being a home issue. Chimneys, flues, and heating systems should be tested and checked before winter days come. Scheduling a heater replacement during the first cold snap is a nightmare way to many home-owners end up going thru. Appropriate firing and maintenance before the cold sets in will not only let you know of a problem early; but will prolong the effective use of your system. Stop using the air conditioning if the temperature outside is going below 65 degrees. AC condensors can fail if they are run while temperatures are to cold. This happens when fall days are warm, but nights are cold. Home owners keep the AC on to cool off rooms heated by daytime sun and forget to shut them down before the night chill sets in. Opening and cleaning the windows is a great thing to do instead of using the AC in the fall. It also allows your home to acclimate to the changes in humidity and temperature more effectively. This stops drywall and paint from cracking. Why is it so important to Prep my Home for Winter? Getting your home ready for winter is important to maintain the integrity and value of your home. The easier you make this on yourself the better; and keeping up with maintenance is always easier than repairing damage. Many insurance companies won’t cover damage if your home is considered un-maintained. A roof leak from a storm will not be covered if the roof has been previously damaged due to neglect. This is true for many systems in the home. Making sure your covered for losses should be every home owners concern. Water infiltration is a major problem causing mold, rot, termite damage, and freeze damage. Stucco homes are exceptionally impacted by neglected caulking, flashing and other penetrations because it acts as a barrier to drying. If a window isn’t caulked correctly it could cause damage to much more than the immediate area. Damage can multiply to the wall, insulation, wall-board, electrical, and any doors or windows below. The stucco can then crack and fail from the freeze thaw cycle and cause even more damage to the home. Stopping water from penetrating the home should always be your number one concern when getting your home ready for winter. The cost of maintenance is far less than damage repair. 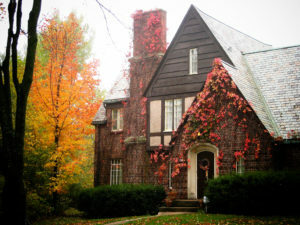 Home maintenance is easier and less expensive in the fall than during winter. Servicing and replacing heating systems is cheaper and easier to schedule before the winter. Window and door replacement and repair is much easier during the fall. The fall is the best time to seed and repair your lawn, and the coolest. Maintaining driveways, patios, and other masonry features around the home is important because freezing water has the power to move and destroy these expensive additions to your home.